Link to Soua's first article. Link to Soua's second article. Soua also presented his research, along with Dr. Wood and Dr. Frank Harris, Associate Professor of Postsecondary Education at SDSU, at the annual meeting of the Association for the Study of Higher Education, Council on Ethnic Participation Pre-Conference held in Denver, Colorado. The paper was entitled "Engaging Southeast Asian Men in the Community College: A Qualitative Examination of the Ways Counselors Foster Welcoming Engagement." Also, Soua received travel awards from the CGU Graduate Student Council Travel Fund. Soua's emphasis is in Higher Education and Student Affairs and his research agenda addresses racial/ethnic disparities in college outcomes, college student engagement and student success, and Southeast Asian students in higher education. Currently, he is examining the experiences and outcomes of Southeast Asian men in community colleges. Soua is also the Co-Coordinator of the Minority Male Community College Collaborative (M2C3) at San Diego State University. Under the direction of the Co-Directors and Associate Director, Soua provides administrative and research support to a national research and practice center. He also provides oversight of the National Consortium on College Men of Color, a capacity-building community of over 60 colleges across the United States that engage in monthly webinars, information-sharing sessions, and annual working group meetings to support the success of men who have been historically underrepresented and underserved in postsecondary education. Soua is actively involved in several professional associations, serving as one of the graduate student representatives for the Research on the Education of Asian & Pacific Americans special interest group of the American Educational Research Association and the Southern Representative for Two Year Institutions for the California College Personnel Association. He also serves on the editorial board of the Hmong Studies Journal and the Journal of Southeast Asian American Education and Advancement. Michael Washington, a student in the SDSU/CGU Joint Ph.D. Program in Education, recently authored a book chapter in The Education Doctorate (Ed.D. ): Issues of Access, Diversity, Social Justice, and Community Leadership, edited by Dr. Virginia Stead. The chapter is entitled "Transforming the Ed.D. into a Force for Culturally Relevant Leadership." Michael also presented his research entitled "The Psychosocial Quagmire of Males of Color in Educational Transition" at the CSU Sacramento Multicultural Education Conference. He also presented his work entitled "Transforming the Ed.D. Program into a Force for Culturally Relevant Leadership" in a symposium at the annual conference of the Canadian Society for the Study of Education and at a symposium at the annual conference of the Canadian Society for the Study of Higher Education entitled "Ed.D. Programs as Catalysts for Social Justice Through Community Leadership." Michael is an adjunct professor for CSU Sacramento's Educational Leadership and Policy Studies Program. He is also a substitute teacher for the Sacramento County Office of Education, the Elk Grove Unified School District, and the Folsom-Cordova Unified School District. He has over twenty-five years of professional experience in various fields such as information technology, case & social work, curriculum development, professional development, corporate training, supervision and management, customer service and quality assurance for several private and public agencies. Karen Lafferty, a recent graduate of the SDSU/CGU Joint Ph.D. Program in Education, recently published in The Reading Teacher with Dr. Marva Cappello, Associate Professor of Teacher Education at SDSU. The article was entitled "The Roles of Photography for Developing Literacy Across the Disciplines." Karen's article can be found here. Karen received here Ph.D. in December 2015. She also teaches English and French at Westview High School in San Diego, California and is an instructional coach for implementation of the Common Core State Standards. While a graduate student, Karen twice assisted Dr. Valerie Ooka Pang for the academic publishing course at SDSU and provided technical support for San Diego State University's School of Teacher Education. At CGU she has assisted Dr. Mary Poplin with her course on teacher education. Recently she designed and taught a course on APA Style for graduate students at SDSU. Karen's research interests include the role of the cooperating teacher in the field experience and the importance of culturally relevant literature in the high school English classroom. She has published in the journals Science and Children, Issues in Teacher Education, and Multicultural Perspectives. Karen also serves on the Board of Directors for the California Council on Teacher Education. Dr. Joe Fulcher and Dr. Mariana Gomez, alumni of the SDSU/CGU Joint Ph.D. in Education, recently accepted new positons at the Sweetwater Union High School District. Dr. Fulcher is Assistant Superintendent for Equity, Culture and Support Services and Dr. Mariana Gomez is Program Manager for Equity, Culture and Support Services. Equity, Culture and Support Services partners with stakeholders to create instructional environments that support academic rigor, access, cultural relevance, and relationships that ignite the potential of each and every student as the norm. The department works to build the capacity of leaders and educators to create inclusive environments that honor each student's ability, race, ethnicity, gender, gender expression, socioeconomic status, language, and sexual orientation. They also develop and implement district-wide education, outreach and training initiatives to promote and sustain a climate of diversity, inclusion, equity, empathy and respect. They also work at monitoring and reviewing district policies and procedures as implemented by the Board of Trustees for equity, relative to the district's students, parents/guardians, staff and community. Congratulations Dr. Fulcher and Dr. Gomez! Polly Card, a student in the SDSU/CGU Joint Ph.D. Program in Education, recently presented her research on the impact of video in blended and hybrid learning with Dr. James Frazee, Director Instructional Technology Services at SDSU, and Dr. Matt Anderson, Senate Distinguished Professor at SDSU, at the annual Directors of Educational Technology / California Higher Education (DET/CHE) meeting. The research explored the attitudes of students towards the educational use of video and technology, and in particular, the Learning Glass. Instructional Technology Services and Professor Matt Anderson developed the Learning Glass at SDSU. It is a low-cost, open technology that facilitates communication by allowing lecturers to look at their audience while writing on a transparent surface. For more info on the Learning Glass check out this video produced by Polly. Also, Polly's multimedia performance exploring race and affect, The Blush Machine, which she produced at Kiosko, in Bolivia 2013 with Katalin Halász, was showcased at Bard College in Berlin last week as part of the In/visibility and Difference: A Visual Methods Workshop. Polly is a British producer who lives in California. She specializes in creating visual media for education, art and communities. Polly's current work on a Ph.D. in Education is central to her practice is the application of theory and research-led design. An understanding of diversity and a clear sense of audience is at the heart of every film. Currently Lead Video Producer and Media Coordinator at San Diego State University, she mentors students and works with faculty to design and develop award-winning instructional media and writes documentaries for the Spanish Ministry of Education. Operating across a wide range of disciplines, recent work includes serving as Panel Chair for California Arts Council 'Arts on the Air' Program, winning the Enterprise Video Award presented by Sonic Foundry and curating 'Visualising Affect', an art exhibition in partnership with Goldmsiths University of London and the International Visual Sociology Association. She worked as a film and radio Producer with the BBC for 8 years and freelances for various clients including The Bill & Melinda Gates Foundation, European Union, Runnymede Trust and Lord's Taverners. Christine Keaney, a doctoral candidate in the SDSU/CGU Joint Ph.D. in Education Program, will be presenting her research at the 2016 Annual Meeting of the American Educational Research Association held in Washington, D.C. in April. She will be presenting her research paper entitled "Identifying Transferable Funds of Knowledge Acquired by Street Gang Individuals for Success in Alternative Contexts" in the Critical Educators for Social Justice Sig. Christine's research interests include the social construction of identity, opportunity development for vulnerable youth, and intercultural education. Christine currently resides in Miami where she is conducting her dissertation research with individuals affiliated with gangs. Melissa Navarro, a student in the SDSU/CGU Joint Ph.D. Program in Education, recently presented at the California Council on Teacher Education (CCTE) conference. With her SDSU faculty mentor, Dr. Cristina Alfaro, Melissa presented "Teacher Preparation Collaborative: Making Rigorous Standards Accessible to Emergent Bilinguals," a session where participants critically examined key instructional areas for supporting both pre-service and in-service teachers in effective implementation of rigorous standards. Melissa presented her data evaluation of Project CORE, a program funded by a $1.5 million grant that prepares teachers to work with emergent bilinguals in addressing the Common Core State Standards. Melissa described the success of a five year program based in collaboration among three local school districts, the San Diego County Office of Education, and San Diego State University. In November, Melissa presented her research entitled "Introduction of the Next Generation Science Standards" at the South Regional California Association for Bilingual Educators (CABE) held in San Diego, California. Melissa has completed her second year in the program. Her research interests revolve around the need to prepare critically conscious educators. Her work and research focus on the sociopolitical, ideological, cultural and linguistic aspects of science teacher preparation. Melissa is the Spanish Science Methods Course instructor for the multiple subject credential in the Department of Dual Language and English Learner Education (DLE) at SDSU. Given her interest in Science education, Melissa is currently conducting a study that compares data from the High School Longitudinal Study (2009) from the National Center for Education Statistics (NCES) and looking at the science teacher questionnaire to determine the impact various teacher variables have on how science teachers perceive their students' achievement. Ana Gabriela Kovats, a student in the SDSU/CGU Joint Ph.D. Program in Education, presented at the National Association for College Admission Counseling (NACAC) National Conference in San Diego, California. In collaboration with Princeton University's Preparatory Program, Gabriela presented "Networks and Strategies to Support Low-Income Students." Gabriela focused on the importance of parental and familial support for low-income, first generation students throughout the college admission process. The presentation included her experiences from the field as well as best practices for college counselors across the country working with diverse student populations and their parents. Ana Gabriela is a first year Ph.D. student in the Joint Doctoral Program with Claremont Graduate University and San Diego State University. Her research interests revolve around ethnic identity development, college access and retention of first generation college students and students of color. Beth Pavez, a student in the SDSU/CGU Joint Ph.D. Program in Education, presented a poster at the Association for Behavior Analysis International 10th Annual Autism Conference held in New Orleans in January 2016. The poster is based on Beth's study entitled: "Evaluating the Mobility and Sustained Practice of M.A. Degree Graduates in Special Education." Beth is a fourth year student who will be finishing her coursework this spring. She presently is adjunct faculty at SDSU, and teaches two courses in the department of Special Education: one titled "Issues in Autism" and the other, "Ethics and Law for Special Educators." In addition, she is also project staff doing research with SDSU for the Center for Secondary Education for Students with Autism Spectrum Disorder (CSESA). Brian Valentini, a doctoral candidate in the CGU/SDSU Joint Ph.D. Program in Education, was nominated for the Patricia L. Sitlington Emerging Researcher Award. This award is given by the Division on Career Development and Transition (DCDT) of the Council for Exceptional Children. He also was invited to present his research at the DCDT annual conference in October. Brian holds an MA in Moderate to Severe Disabilities from Teacher's College at Columbia University and a BA in Special Education K-12 from the University of Cincinnati. His primary research interest focuses on the transition from high school to adulthood for people with developmental disabilities. Currently, Brian and his advisor, Dr. Kraemer, are researching parent's longitudinal experiences with transition programs. Brian hopes to continue this line of research and focus on competitive employment and quality of life for those who exit the special education system. The SDSU/CGU Joint Ph.D. Program in Education would like to welcome Alison Sternal as the new program coordinator. Alison replaces Maribel Flores who moved into a new position in the Dean's office at the College of Education at SDSU. Alison graduated from UC San Diego with a degree in Literature and Writing. After receiving her multiple subjects teaching credential from SDSU, she taught elementary school for five years in Yuma, Arizona and El Cajon, California. She is currently pursuing her master's degree in K-8 Mathematics Education at SDSU. This fall, a reception to welcome to the new students to the SDSU/CGU Joint Ph.D. Program was held at the Faculty/Staff Club at San Diego State University. Dr. Scott Thomas, Dean of the School of Educational Studies at Claremont Graduate University, Dr. Joseph Johnson, Dean of the College of Education at San Diego State University, and Dr. Rafaela M. Santa Cruz, Director of the SDSU/CGU Joint Ph.D. Program in Education, opened the reception with welcome messages. Faculty members, administrators and returning students were also in attendance and shared their thoughts on their experiences in the program. Michael Washington published a book chapter and presented at multiple conferences. 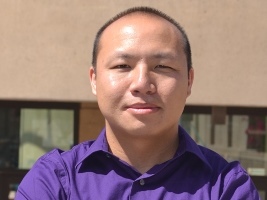 Soua Xiong published 2 papers and presented at ASHE. Karen Lafferty published in The Reading Teacher. Two program alumni accept new positions. Polly Card presents at DET/CHE. Christine Keaney will be presenting at AERA.